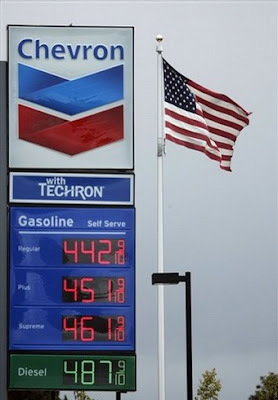 That's the newest average price per gallon of gasoline in America. According to CNN, the cost of gasoline has risen three percent in the last month and 39 percent in the last 12 months. And because of this, AAA anticipates about a one percent--or just over ten million people--drop in travel this holiday weekend. The last time the U.S. experienced a drop in July Fourth travel was in 2001. So, in honor of Independence Day, we're not going anywhere. We will celebrate this country's unique and hard won existence by proclaiming our family's independence from gasoline, if only for a day.